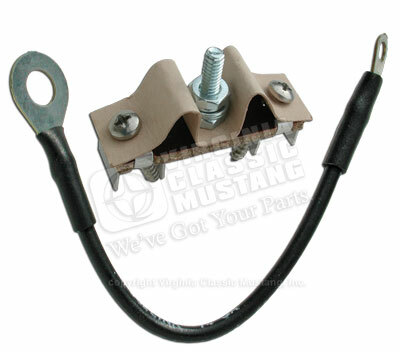 There were lots of changes over the years in terms of the power top switch wiring on a Mustang Convertible. All of them used some type of circuit breaker or fuse link. 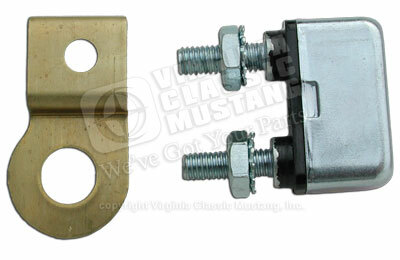 The first picture shows what was installed on the 1964 1/2 and 65 Mustangs. The bracket mounted the circuit breaker on the starter solenoid. Strangely enough, this set up apparently appeared again on many 1970 Convertibles (and maybe 71-73.) This is our part number ST155. Next we have the set up for the 1966-68 models. This is an "isolator" style junction block. The block mounts below the starter solenoid. The hot wire from the power top switch attaches to the post and then there is a fuse link that attaches from there to the starter solenoid. This is a super nice reproduction that even includes the paper/cardboard cover like the original. It is part number ST156. Finally, our new offering is for the 1969 (and maybe some 70 model) Mustang Convertibles. It is the entire feed wiring with a fuse link that plugs in at the end, just like the original. It is part number ST1561. All of these parts are very difficult to find, so it is really nice to have these super reproductions available! HiPo Fan Spacers are in stock! !